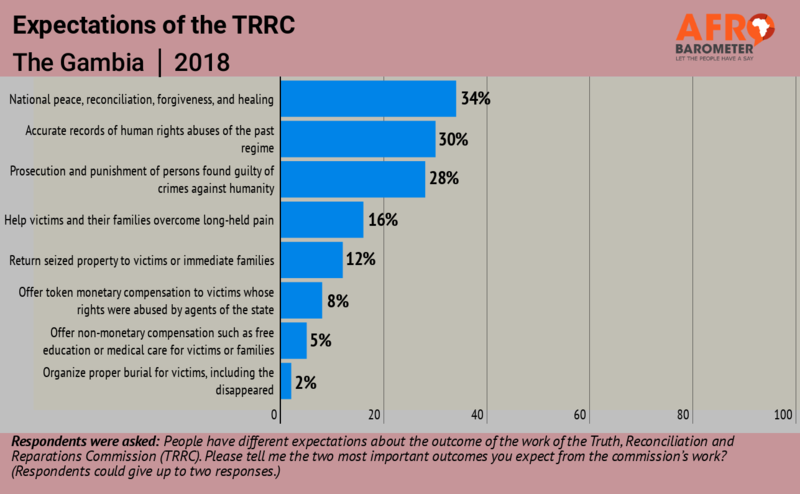 Gambians have varying expectations of the Truth, Reconciliation and Reparations Commission (TRRC), including both national healing and justice, Afrobarometer’s inaugural national survey in the country reveals. More than one-fourth of Gambians say they or a member of their family suffered at least one form of human-rights abuse at the hands of former President Yahya Jammeh’s regime, and a majority of citizens believe that perpetrators should be tried in court. However, opinions are divided on whether to seek extradition of Jammeh to face justice in the Gambia. While facing a variety of citizen expectations, the TRRC will also have to work to become known and trusted by the public: Fewer than half of Gambians say they trust the TRRC. The government of President Adama Barrow established the TRRC as part of a broader transitional-justice process aimed at addressing past human-rights abuses and building a stable democratic future through justice moored to respect for the rule of law and human rights. The commission is reported to have received pushback from Jammeh supporters and tagged as a “witch hunt” aimed at the former president.